Read This Really Big Announcement! We at the Estipona Group recognize how truly blessed we are. We’re doing what we absolutely love. We are surrounded by a talented team and spectacular clients. We work primarily from our home offices, which means we avoid most of the rush hour Spaghetti Bowl pile-ups and don’t feel passively hostile toward co-workers who steal our egg salad sammies from the community fridge. You’re welcome, home. Consider it a giant cosmic spitball of goodwill. If you talk to Edward, company founder and spewer of many slaughtered idioms, he’ll acknowledge that so many times during every year he has owned this company – 23 this year – he has felt a profound sense of gratitude for this community of ours. And we, his faithful minions, feel the same. So it further recently occurred to us (yes, many things occurred to us in this reflection – we were in a thoughtful mood, what can we say): We should do something to commemorate our gratitude. moment: How about a good deed for each year we’ve been in existence? What’s so exciting about this idea is that we’re committing ourselves to a concrete reflection of our gratitude, and the amount of gratitude appropriately increases every year as the agency ages and continues to thrive. Heck, by the time the agency is 50 years old, our goal is to be shouting, “You get a car! You get a car! YOU GET A CAR!” to random clients and a few other people we like. As in, good deeds. The kind that make us feel all warm and fuzzy. And we’re looking at you to help. You see, individually, each one of us on the Estipona Group team has our favorite pet causes. But we know there’s more out there. And that’s where you can help. So pitch us: Do you know a non-profit that needs help — either through sheer muscle or perhaps marketing help, like a new logo or business card design? Is there an under-the-radar organization for which we can help raise awareness? Do you volunteer for a community organization and simply fancy the idea of working side-by-side with us? We’re going to be helping about two local agencies per month, so your ideas will help us fill up our comprehensive calendar of kindness. The Women & Children’s Center of the Sierra provides support to help women escape poverty and provide a better life for their families. And one thing many of these women desperately need that they can’t afford: diapers. We’ll be holding a diaper drive in the month of February, with local drop-off points. We’ll keep you posted on locations, so check back to our Facebook page if you’d like to help us with this important cause. Representatives from our team will be cooking a home-style meal for the families staying at the Ronald McDonald House Northern Nevada on Leap Day: Feb. 29. We’re bringing a crockpot of comfort food and some decorations, hopefully helping these family members of hospitalized kids by providing a warm, stress-free meal. Of course, we’ll keep you posted on our progress. Follow us on Facebook, Instagram, Twitter and this newsletter as we spread the word about these local agencies and how we’re helping. 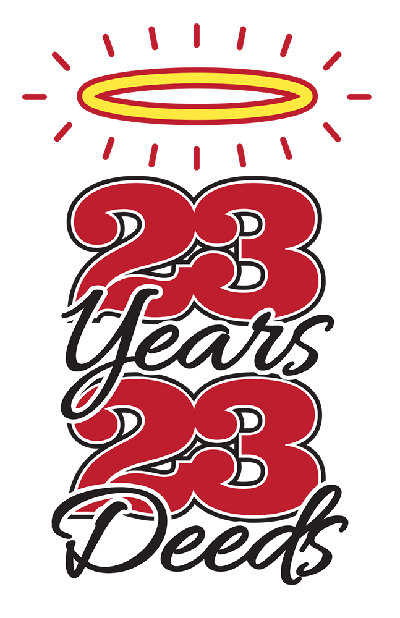 And remember: Send us your ideas for #23Years23Deeds. Especially if you want a place on our “people we like” list for when we start handing out cars.